The annual Fine Books gift guide offers 20 terrific ideas for bibliophiles. 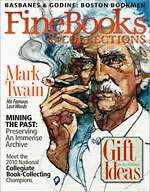 The centennial of his death and the 175th anniversary of his birth, 2010 has been a yearlong celebration of all things Mark Twain, concluding with his enigmatic autobiography, published this fall. Meet the 2010 National Collegiate Book Collecting Contest winners. Publisher and collector David R. Godine. Conservator and bookbinder Peter Verheyen. The attraction of original boards. Explore the hidden worlds of Magellan and Cook at Princeton. Round two of the Arcana sale.